This article shall serve as a sort of transition from the previous one for reasons to become clear momentarily. As another foreword, I should mention that shizzle’s gonna get intense in this one. Indeed, some of the problems can be fixed in that manner. Does that mean that merely some of the problems without the Oxford comma can be fixed in the same manner? Are the neglect and utilization of the Oxford comma equal according to this proposition? The image illustrates the fact that, because the order of the final two items of an Oxford comma-less list does not matter, the number of combinations (that is, those combinations that will establish clarity) will always be fewer than that of an Oxford comma-ful list. 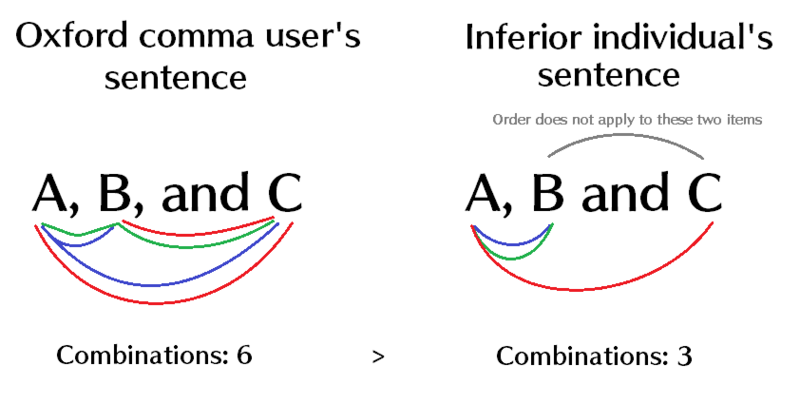 Thus, the probability that the implementation of the Oxford comma will provide clarity to a list of three items is twice that of the neglect of the Oxford comma; this ratio will change as the number of total items increases, but it doesn’t take a mathematician to realize that the superior comma shall continue to dominate numerically. Furthermore, it isn’t only the theoretical possibility of lack of clarity that attests to the Oxford comma’s preference, but what if a writer seeks to minimize the number of rearrangements? What if one values life more than liberty and the pursuit of happiness, and consequently intends to keep it at the beginning of the list at all costs? Indeed, the serial comma reigns supreme yet again, for six combinations will permit much more flexibility in that area than three. I don’t feel like thinking of a good conclusion to this article.